There are many cafes in kyoto. I like to go there to relax , chatting with my friends or reading books. for relaxing and reading books I choose very quiet cafe and must have comfy sofa. I am going to introduce some of my favorite cafes here. Located the building of 10th floor in Kiyamachi st.
you can enjoy nice Kyoto view from there. you can have coffee , sweets also alchols and snacks. comfy sofa is there so it is very good for dating or have fun with your friends. This cafe is also located in Kiyamachi st. they serve very very delicious cakes. This cafe is looks like lovely white small house. In the showcase There are many cakes . to have today,because I wanna eat all of them! I found this cafe when I was walking to Heian shrine this is on shinkarasuma st .I have never been here but I wanna try someday. outside looks very nice japanese building ! but I think they serve not only japanese food. you can enjoy coffee with your dog here. These cafes are very close from our hotel. There are many cafes in Kyoto I am trying to go many many of them to find nice one. If you find some nice cafe please let me know ! You might have been Yuka if you have visited Kyoto during summer time. Yuka means floor in Japanese. 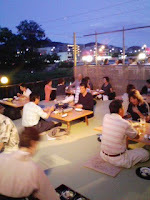 We call river side dining platform in Kyoto "YUKA". Yuka is set up along the Kamo river during summer summer time. Surprisingly first yuka appeared about 400 years ago. The beginning was nothing more than public wooden benches placed riverside. Then, wealthy people set up the bench and table along the river to entertain important visitors. After that, food stalls started opening along the riverbank. Today more than 80 restaurants set it up and and it becomes very popular attractions in Kyoto. I went to yuka first time lately. It was interesting! You can have dinner in the breez. Food was delicious. 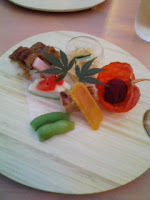 I had kaiseki dish which is kyoto's traditional meal. This photo below is kind of antipasto. You can also have French, Italian, Korean... several kinds of food at Yuka. Why don't you trying yuka another time? It was beautiful day on last weekend. I went to walk to Heian shrine. It is bit far from our hotel but some of our guests try to walk to there sometimes so I wanted to know how long does it takes walk to there. I leave our Ryokan at 13:30pm and walk up to north for marutamachi st. When I get Marutamachi st and turn right to East. I saw there are many foreigners there. When you find this Handicraft center you are almost there !!! walk to South from Marutamachi st and walk about 2minutes there are many huge buildings and turn left . Its takes about 25minutes walk from our Hotel to Heian Shrine. there are another way to walk to there little bit closer but I wanted to visit Handicraft centere so I choose this way. I found one lady front of Heian Shrine. she is carrying JINRIKISHA ( ricksha) . Jinrikisha is a mode of human powered transport a runner draws a two-wheeled cart which seats one or two persons. The cost is from 2000yen for 10minutes for 2people up to 30,000yen for 2hours. It start to be much cooler in Kyoto now so it is good to walk around Kyoto city! We changed our name "NISHIYAMA RYOKAN" from begining of September. It took 2 months to have repainted out side of the wall and we feel very sorry for the guests who stayed at our ryokan during construction. Many thanks to them! The new logo is mountains and sunset. NISHIYAMA means west mountain. Mountains come from "YAMA" which is part of our name and the sunset stands for that our guests come back at sunset and we would like them to have a relax at our ryokan after sun sets. We always wait for your arrival and are glad to welcome all of our guests to our ryokan! Please have a relax and enjoy stay with us!